A) Hybrid optical/mm-wave access network with beamforming capabilities. B) Principle of optical true time delay beamforming in a linear phased antenna array with multicore optical fiber distribution. C) Schematic diagram of the experimental setup. The tremendous growth of worldwide data traffic over the past years means that the future access network architectures will be revised. The flexibility of wireless links, compared with wired ones, makes them more adequate and cost efficient in several scenarios. Consequently, high-capacity wireless interfaces must be integrated with optical networks without imposing a capacity bottleneck. The millimeter-wave (30â€“300 GHz) band is postulated as the main candidate to extend the capacity of wireless interfaces because of highly available bandwidth resources. However, a high-gain directive antenna with beam steering capabilities must be used in this spectrum region to overcome large free space attenuation. The shift of the beamformer network to a remote central entity is completely different from common approaches. The main advantages are the central management of the beamformer configuration for different antenna units and the reduction in the deployment costs of new base stations. 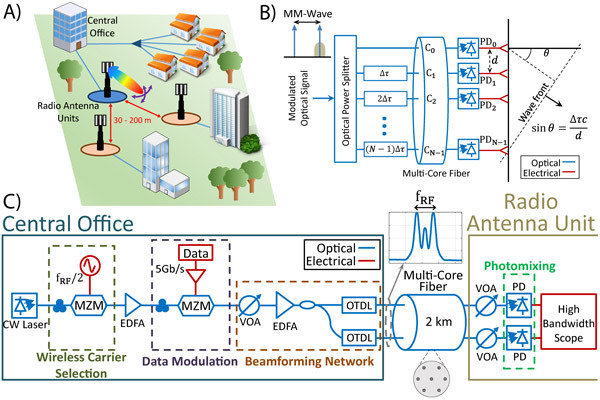 The results serve as engineering guidelines for the design of a hybrid optical/millimeter-wave access network with centralized beamforming capabilities. "Most researches agree that new paradigms for the next generation of radio access networks will rely on the deployment of a large number of radio stations, multi-antenna systems, and millimeter-wave communications," said Prof. Idelfonso Tafur Monroy from Eindhoven University of Technology, "The ideas proposed in this work are in accordance with this philosophy." Further work will be focused on the end-to-end design of the radio frequency segment and the reconfigurability of the beamformer to make the proposed system suitable for implementations.